The Induction Machine Field-Oriented Controller block implements an induction machine field-oriented control (FOC) structure using the per-unit system. To decouple the torque and flux, FOC uses the rotor d-q reference frame. The figure shows the control structure. ωr is the measured angular velocity. ωref is the reference angular velocity. id and iq are the d- and q-axis stator currents. ia, ib, and ic are the a-, b- and c-phase stator winding currents. imr_ref is the reference magnetizing current. imr is the magnetizing current. vd and vq are the d- and q-axis stator voltages. va, vb, and vc are the a-, b- and c-phase stator winding voltages. GAH, GAL, GBH, GBL, GCH, and GCL are the a-, b- and c-phase high (H) and low(L) gate pulses. The implementation uses the per-unit system. The control structure implementation uses a single sample rate. Magnetizing reference current in the per-unit system. Rotor reference velocity in per-unit system. Measured phase currents in the per-unit system. Measured angular velocity in per-unit system. Inverter gate pulses. The block does not consider any dead time. Bus containing signals for visualization. Rotor, stator-side resistance in the per-unit system. Rotor stator-side leakage inductance, in the pu-unit system. Magnetizing inductance in the per-unit system. Time constant for filtering the d and q currents. Fundamental sample time must be less than the control sample time. Control sample time must be greater than the fundamental sample time. 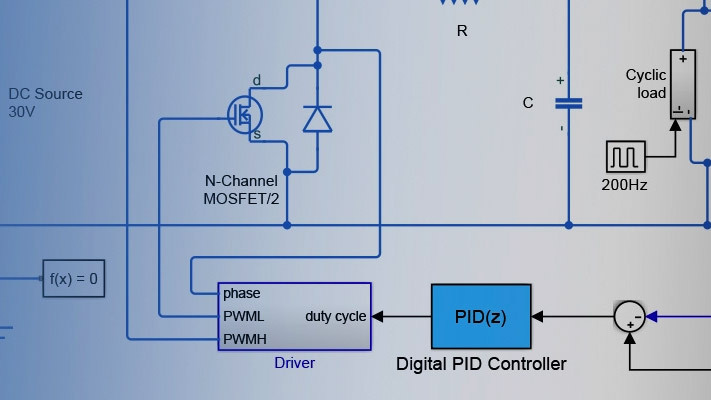 Proportional gain for the magnetizing current controller. Integral gain for the magnetizing current controller. Integral anti-windup gain for the magnetizing current controller. Proportional gain for the speed controller. Integral gain for the speed controller. Integral anti-windup gain for the speed controller. Maximum current for the d-axis. Maximum current for the q-axis. Align the a-phase vector of the abc reference frame to the d- or q-axis of the rotating reference frame. Prioritize or maintain ratio between d- and q-axes when block limits voltage. The sampling mode determines whether the block samples the modulation waveform when the waves intersect or when the carrier wave is at one or both of its boundary conditions. Model an electric vehicle dynamometer test. 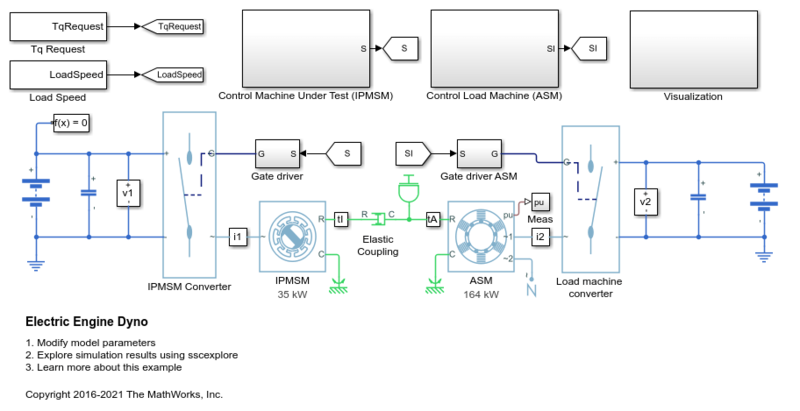 The test environment contains an asynchronous machine (ASM) and an interior permanent magnet synchronous machine (IPMSM) connected back-to-back through a mechanical shaft. Both machines are fed by high-voltage batteries through controlled three-phase converters. The 164 kW ASM produces the load torque. The 35 kW IPMSM is the electric machine under test. The Control Machine Under Test (IPMSM) subsystem controls the torque of the IPMSM. The controller includes a multi-rate PI-based control structure. The rate of the open-loop torque control is slower than the rate of the closed-loop current control. The task scheduling for the controller is implemented as a Stateflow® state machine. The Control Load Machine (ASM) subsystem uses a single rate to control the speed of the ASM. The Visualization subsystem contains scopes that allow you to see the simulation results.